The atmosphere is warm (thanks to the lovely and knowledgeable staff – ask Allysia for suggestions if you don’t know what to order), the space is large and the decor is rustic chic (unfinished wood slats, a chalkboard noting the restaurant’s specialties, a bookshelf filled with artfully placed books, magazines and jars of chocolate, vintage looking burlap sacks with the Cacao 70 logo imprinted front and center), making it a perfect stop for a romantic date, a catch-up session with a friend or even somewhere to grab a late night sweet snack. 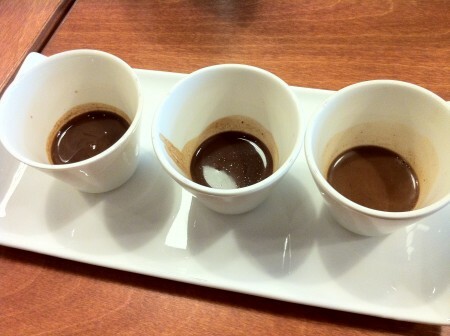 We sat down to three cups of warm cocoa – one made of dark, one of semi-sweet and one of sweet chocolate. These were notably different – you might not think you can taste the difference but once having them one after the other, it is clear each has a distinct taste. I particularly liked the darker chocolate – I’m just a big fan of the stronger, deeper flavors that are less sweet. My companion is a huge chocoholic (me – less so) and loves anything chocolate. He was more into the Cacao 70 sweet cup – which was by all means great as well. Going on to try the roast beef crepe with mushrooms and cheese, we found the thickness of the crepe and the saltiness of the dish just right. Balanced with the mixed salad which had a sweeter sauce, we gobbled the whole thing up in spite of eating a full meal just before coming for the tasting (We hadn’t done our research properly and had mistakenly thought that the place sold mostly hot chocolates and not much else. Boy, were we wrong!). Next came the hot cocoa – we each got a serving of the 70% Cuba. Coming in goblet-like cups, they were rimmed in chocolate. 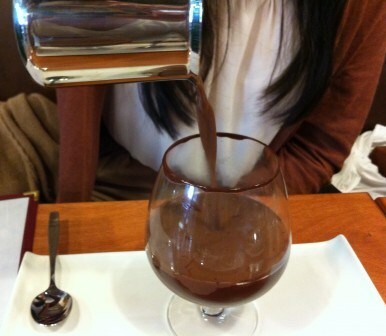 Allysia explained the reason to us: so that when we drink from the glass, we’d have chocolate smiles! Cue the cute, fuzzy feelings. So adorable. Little things like that really show that the whole concept has been thought out to a T which I totally appreciate. The way to go about eating this dish is to use a spoon and get a little taste of the base – what gives the real flavor to the chocolate drink; the Cuba 70% had hints of cinnamon and bitterness and a slight spiced aroma which I loved. Once that’s done, you mix in the lighter chocolate to make it drinkable and voila! There you have it. Finishing off with a chocolate pizza, we were taken by surprise as to what it actually was. 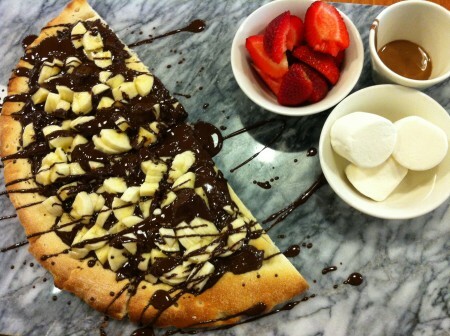 Upon first hearing about the chocolate pizza, we assumed it was a round, pizza shaped hardened piece of chocolate. Nope! This place is teaching me new things. 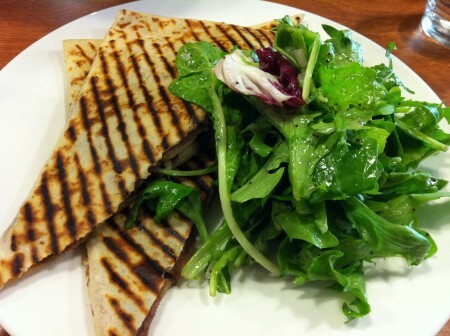 It is baked dough topped with a variety of delicious ingredients. Our pizza came with bananas drizzled with chocolate sauce with sides of marshmallows and strawberries to add as we wished. There was also a lighter chocolate sauce to further add if we found the existing sauce to be too strong or thick. 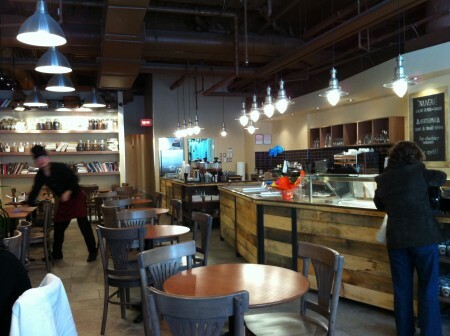 Cacao 70 offers a unique dining experience that revolves around one of the world’s most loved desserts: chocolate. We will definitely be back. *Special thanks to Easy and Allysia for having us come by. Tags: Cacao 70, Cheese, Chocolate, Chocolate Bar, Chocolate Pizza, Cocoa, Crepes, Cuba 70%, Date, Hot Chocolate, Marshmallow, Montreal, Roast Beef, Salt, St. Catherine, Strawberry, Sweet.